We stayed pretty healthy all summer long, but last month my entire family caught a virus. Although I'm pretty sure we're almost back to normal, we're all still coughing every once and awhile. Back-to-school often means increased colds and illnesses, especially for young children. Books can help teach children about the spread of germs and ways to prevent illness. 'Mom said, "You've caught a bug. Hop back into bed. I'll make chicken soup. We don't want this to spread." 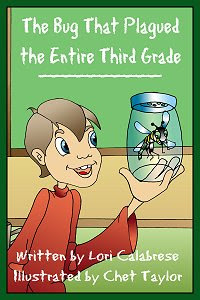 Lori Calabrese recently released her first children's book, The Bug That Plagued the Entire Third Grade. Her book puts a humorous spin on the phrase, "I've caught a bug," commonly used when referring to an illness. Third-grader Matt discovers an unusual insect on his Dad's car and excitedly puts it in a bottle to take to his school's Bug-A-Fair. He hopes to win top prize showing off his special bug. Unfortunately, things take a turn for the worse. The morning of the Bug-A-Fair, Matt catches another type of bug, the cold bug! He insists on going to school and creates havoc in more ways than one. It's tempting to go to work or school even if you're sick, especially when an important event is taking place. However, as Calabrese's book illustrates, this action is inconsiderate because you expose others your illness. My daughter loves school so much that she was in tears when she found out she was going to miss a day of school due to a fever and illness last month. But, after reading Calabrese's book together, she was able to better understand why it is best to stay home when she "catches a bug." The story, told in rhyming verse, tackles a serious topic in a silly, fun way that kids will enjoy. Also worth mentioning -- the insect featured in the book, the Hines Emerald Dragonfly, is actually a real bug found in Illinois, Michigan, Missouri and Wisconsin. This type of dragonfly is truly rare. According to the U.S. Fish and Wildlife Service, the Hines Emerald Dragonfly is on the endangered species list. Calabrese creatively manages to educate and inform about two seemingly separate subjects by wrapping them together in a cute story. Ironically, her book is published by a small press named Dragonfly Publishing, Inc! I wish she would have included even more factual information about the interesting, endangered dragonfly in her book. Calabrese's website includes pdf teaching guides about germs, extinction, and other book related activities. Thanks to Lori Calabrese, one Brimful Curiosities reader will win an autographed paperback copy of The Bug That Plagued the Entire Third Grade. To enter, leave any comment relevant to this post. Or, let me know your favorite books for children about viruses and colds. • Contest ends on Monday, November 22nd, 2010 at 11:59 PM CST. My son LOVES school just like your daughter and was so upset when he got a stomach virus last week and had to stay home for two days. It's a difficult thing to teach children about spreading germs, so I hope the book can be a good resource for parents and teachers. My granddaughter is in 3rd Grade and she thinks this would be the best book ever! I follow and subscribe by email. I like the fact they use a real bug in the story, it's nice when the kids are learning while enjoying a good story. I had no idea that the Emerald Dragonfly was endangered. My niece is in 4th grade and would have a blast with this. Considering we just got over a "bug" and I just came back from the hospital because of this "bug" I think my kids would really enjoy reading this. Anything that takes Mom down has to be cool. But also my sons are always putting things in jars to keep and figure out what it is. Mostly it ends up being spiders. My 2nd grader "played well" on Friday so that she could make Stone Soup with her class and because she couldn't miss the spelling test. When I picked her up she looked awful and had a fever. Good thing she has a nine day weekend and should be feeling fine by Thanksgiving! Sounds like a great read! I would love to give this to my young cousin for Christmas or a birthday! My son is in the third grade and he loves bugs...his teacher keeps them in her classroom (including a praying mantis). I think he would love this book! This is a wonderful book for my grandson, he loves school and hard to keep him home when he does have a bug! My niece Hannah loves science and medicine! I think my son would love this book! I love the idea of this book and really like that the bug is native to our state (illinois!). It makes reading it in a classroom setting that much more educational! It also looks like a fun read and a great story line! Thanks for the giveaway! I would love to share this book with my students!